I will bless the peacemakers and call them My children. How do you think a father feels when he sees his children are fighting with each other in his home? As a father myself, I know how grieved I have felt when I have seen my children not getting along. A father's heart is for peace and harmony for his kids. When I think of this promise, I am encouraged that there is a blessing for us when we love peace and we do everything within our power to live at peace with all those around us. Sometimes it is simply not possible, but as far as it is within our control, may we be a people that love peace. 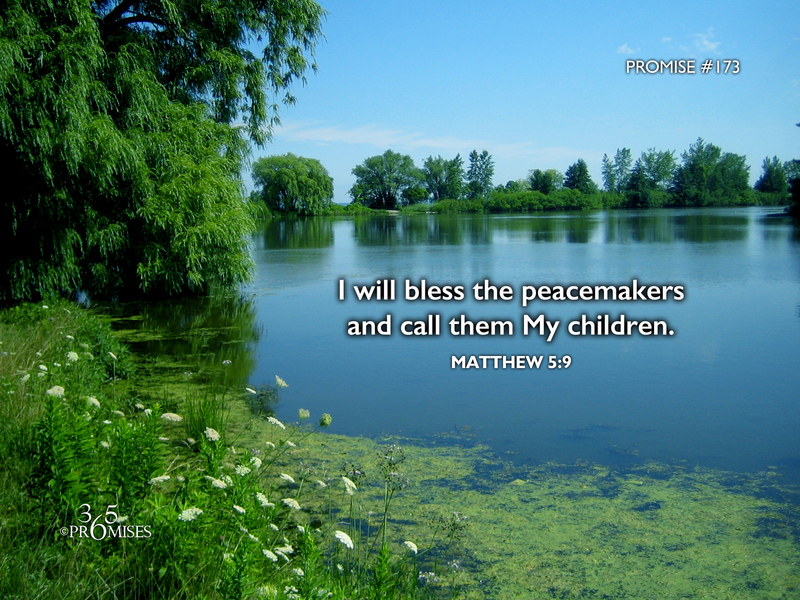 In today's promise, we read that the children of God will be peacemakers. Since we have been made one with Jesus and one of His names is the Prince of Peace, may we love to bring peace wherever we go. May we be dispensers of peace in places of turmoil. May the peace that passes our understanding guard our hearts and our minds in Christ Jesus. My heart's cry is that all of us within the Body of Christ would look to nurture peace wherever we go.